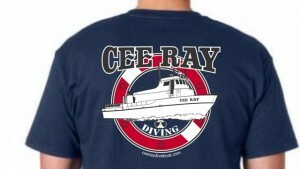 Welcome to the Cee Ray Dive Boat! We now have available for you to purchase Cee Ray T-Shirts Please go to the “Trips & Classes” tab to purchase your new shirt! As owners of Southern California Dive Adventures, we are Michael & Kim Lancaster. Our goal is to make your diving experience in Southern California an Adventure that you’ll never forget. Enjoyable, relaxed and worry free. We are both US Coast Guard Licensed Captains and we are both Handicapped Dive Buddies. Michael is a Naui Instructor, CPR First Aid Instructor, 02 Instructor and Nitrox Instructor with over 40 years of diving experience and Kim is a Naui Dive Master. As well, Kim is also a graduate of the The International Culinary School at the Art Institute of Orange County where she studied Culinary Management. We have professionally planned menus. If you have special dietary restrictions, please just call us and let us know!